Folk on the Silver Screen: The 20th century folk music revival has been covered well. 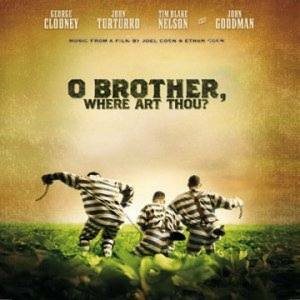 The Coen Brothers paid homage to American old-time music in "O Brother Where Art Thou? 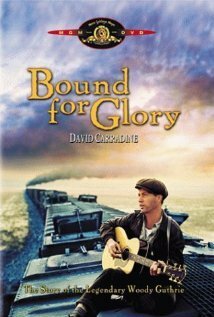 ", "Bound for Glory" followed the tracks of Woody Guthrie, and "A Mighty Wind" made fun of ersatz folk ensembles such as The Kingston Trio. Now the Coens were at it again and took a look at the budding folk scene in New York City's Greenwich Village in the early 1960's. Starring Oscar Isaac, Carey Mulligan, Justin Timberlake, John Goodman, F. Murray Abraham. Follow a week in the life of the young folk singer and guitarist Llewyn Davis. Guitar in tow, he strays through Greenwich Village in the cold winter of 1960/1961 (Bob Dylan has not yet arrived on the folk scene). Llewyn's musical duo partner has committed suicide, his solo album "Inside Llewyn Davis" is not selling, he cannot make a living as a musician and is sleeping on the couches of friends and acquaintances. The Coen Brothers were inspired by the life, music and posthumously published memoir, "The Mayor of MacDougal Street", of country blues interpreter Dave Van Ronk (1936-2002) - albeit only local color and a few scenes (E. Wald) made it into the finished film. 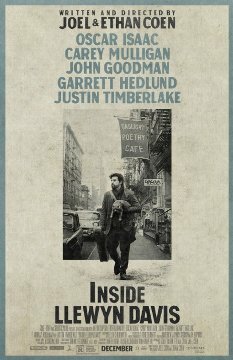 The film's title, for example, derives from the LP "Inside Dave Van Ronk" (1963), featuring the traditional ballad "Hang Me, Oh Hang Me" which Llewyn Davis sings at the beginning of the film in the Gaslight Café. 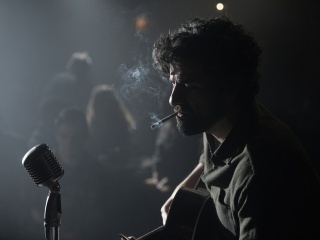 Llewyn Davis is played by Oscar Isaac (The Nativity Story, 2006; Agora, 2009; Robin Hood, 2010), who played guitar and sang in rock bands before he became an actor. Justin Timberlake portrays Jim Berkey, one half of the folk-music duo Jim and Jean (in real life Jim Glover and Jean Ray, Jim taught Phil Ochs how to play guitar). John Goodman is a nasty, drug addicted jazz musician, loosely based on blues singer Doc Pomus. F. Murray Abraham is producer Bud Grossman (based on impresario Albert Grossman who managed Bob Dylan and discovered Peter, Paul & Mary). Llewyn is auditioning and playing "The Death of Queen Jane," Grossman dryly observes, I don’t see a lot of money here. Instead he is offering Davis the third part of a designed folk trio to target the mainstream music market. 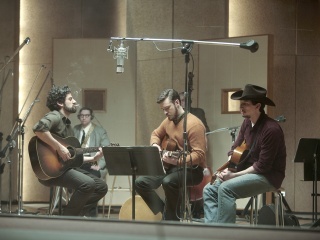 Once again the film's musical director was T-Bone Burnett (likewise "O Brother, Where Art Thou"), who produced the music in association with Marcus Mumford (heard but not seen in the film as Llewyn's deceased duo partner). 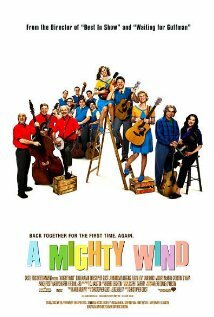 Except the lip-synched Irish song "The Auld Triangle" all songs are sung by the film's cast, notably lead Oscar Isaac rendering melancholic traditional ballads: "Hang Me, Oh Hang Me", "Fare Thee Well" (Dink's Song), "The Death of Queen Jane" (with original music by Dáithí Sproule ), Ewan MacColl's  "The Shoals of Herring". The Punch Brothers  add stripped-down accompaniment. "Five Hundred Miles" and "The Auld Triangle" with Justin Timberlake and Marcus Mumford surprise with full harmonies we're used from "O Brother". Last but not least, the soundtrack finishes off with an unreleased studio track from Dylan himself; "Farewell" sends the signal that the times are a-changin' ... for the Greenwich Village folk scene in general and Llewyn Davis in particular. Even if the film is nothing for your personal taste (too boring, too bizarre, too ...), the soundtrack stands on his own, a beautiful collection of simple and plain folk music still relevant today. 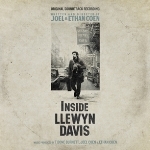 Various Artists, Inside Llewyn Davis. Nonesuch Records, 2013. However, though Oscar Isaac's performance is gorgeous, his character isn't. Llewyn Davis is a loser. His musical career is a disappointment as well as his personal life. A pathetic man stuck in a static world, he is unlikable, sometimes hard to bear. "Inside Llewyn Davis" has not the beautiful charm of the Academy-award-winning, low-budget film "Once", neither is it an entertaining odyssee as the Coen's own "O Brother Where Art Thou?". As a work of art though it has its own merits - if only displaying stark facts and delivering the message that even a weak and hideous character such as Llewyn Davis can produce beautiful and terrific music. Based on Homer's "Odyssey", chain gang escapees in 1937's Mississipi are trying to recover the buried loot of a bank heist and getting to make a number one old-time record along the way. Adapted from Woody Guthrie's 1943 autobiography, the biopic follows the singer-songwriter's travails from the Dust Bowl of Oklahoma to the orange groves of California in the 1930's depression era. Photo Credits: (1)-(7) Film/CD Cover, Film Stils (unknown/from websites).